For those of us without legal training, legal problems can be scary and overwhelming to tackle. Without open access to useful and trusted legal information, it would be near impossible. 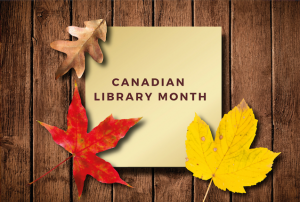 We are lucky in BC to have a network of public legal education and information organizations working hard to improve access to justice, and local public libraries are a key part that network. Funded by the Law Foundation of BC, LawMatters is the Courthouse Libraries BC outreach program for public libraries. We believe libraries are the key to informed and connected communities and have been working in partnership with them since 2007. Together with our library partners, LawMatters works to enhance local public access to legal information throughout the province, from big urban centres to small rural communities. Libraries are able to buy more legal books through LawMatters grant funding, and also receive print copies of some of our most popular Clicklaw Wikibook titles at no cost, such as JP Boyd on Family law. In total, people in 241 communities can find core legal resources at their local public libraries as a result of this program and the hard work of librarians and library staff in each location. 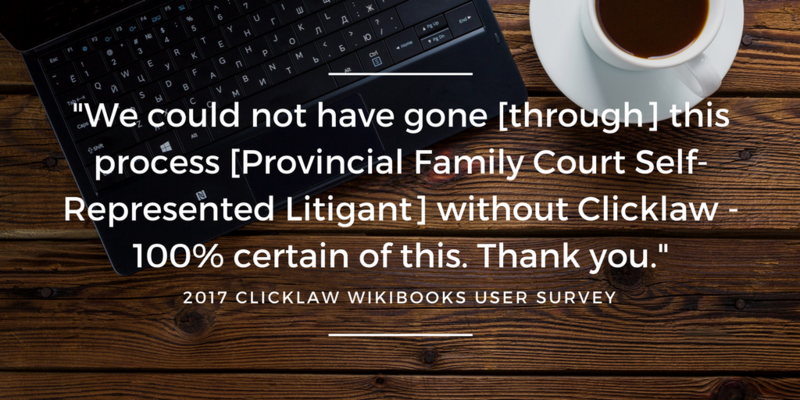 One of the key aspects of our work is to provide training to public library staff on finding and using legal information resources – like Clicklaw. We regularly hear from librarians that Clicklaw is their ‘go-to’ when answering patrons’ legal questions because it provides ideas for next steps, helps them point their patrons towards the best resource, and when necessary, helps them find the right referral. But it’s also true that librarians are a key part of improving Clicklaw – the relationship is complementary. Public librarians contribute valuable knowledge, expertise and insight so that we can continually develop and improve the site for all users. People go to public libraries for the widest range of reasons. Neil Gaiman & Chris Riddell have recently done a beautiful job of expressing the value of libraries, so I won’t attempt to do it here. But I will say to those of you who are struggling with legal issues: Don’t forget about your local public library! They not only provide free public access to legal books, they can also provide referrals to advocates and other community organizations. They are a quiet safe space for you to think, research, and plan. Lastly, while librarians cannot give legal advice, they are a great resource because they are really good at finding current, reliable, and vetted information. They can help you find the information you need, and if not, help you find the people who can. While we would prefer a world in which no British Columbian needs online help for their legal troubles, the pageview count for our Clicklaw Wikibooks website confirms that is not the world we live in. In reality, hundreds of thousands of British Columbians seek out timely legal information in the course of an average year. For many, this is their only line of support. In 2017, Clicklaw Wikibooks — which uses the same software that runs Wikipedia — served nearly 940,000 pageviews to over 550,000 individual users. Each year we see these figures growing. Whereas Clicklaw is a comprehensive legal information website centralizing reliable resources and services from numerous contributor organizations in a variety of formats and languages, Clicklaw Wikibooks is more like a publishing platform. It offers a bookshelf of select legal titles from organizations and independent authors or teams of contributors. These books are for the public and can be read online, downloaded as PDF or EPUB, or ordered by print-on-demand. The most popular way for visitors to consume the 26 or so titles currently on Clicklaw Wikibooks is to read them online. Usually when we report traffic statistics, we think about the book as a whole. 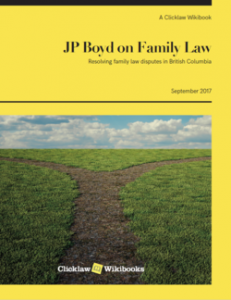 For example, JP Boyd on Family Law is easily the most read title in the collection accounting for about 40% of traffic. But today we look a little deeper to see what the 7 most popular content pages were on Clicklaw Wikibooks for January 2018, give a shoutout to those responsible for their review, and see what insights this data allows. Surprisingly, for instance, while the overall traffic to JP Boyd on Family Law hints that relationship breakdown as the major legal concern, individual page stats reveal the most popular page from that title is on how to get married in the first place. Looking at the top performing pages can give us clues and help us question assumptions about the types of legal information people need. Here is a list of the top seven pages on Clicklaw Wikibooks, the people responsible for their upkeep, plus some thoughts on what this might mean. The list reflects statistics from January 2018, plus relevant changes in a page’s position from January 2017. Feel free to chime in with your own thoughts in the comments section below, or by sharing them with us on Twitter @Clicklaw. This page from the popular Dial-A-Law collection by CBA BC attracted 5.18% of total site traffic, up from second position and 2.83% the previous January. That is an incredible figure for a site with over 1,500 pages of legal information. Many people first come into contact with the criminal justice system when they are served with an appearance or summons, so we can well imagine finding this page is a first step for many in addressing their problem. Knowing the significance of that step, what else could the page do or point to? 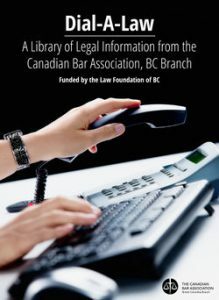 Kudos to lawyers Jordan Allingham and Paul Briggs for writing the page, plus Annie Chen of the CBA BC for the wiki version of this much valued resource. #2 – How Do I Get Married in British Columbia? As noted, JP Boyd on Family Law’s most popular page in January had nothing to do with getting divorced. Quite the opposite in fact… 2.82% of visitors came to learn about how marriage is brought to be, rather than how it decays. The page is up from #4 position in January 2017. Thanks to lawyer Thomas Wallwork for maintaining this page, and of course to JP Boyd himself for his original work on it. #3 – I Need to Take Someone to Court — What’s the Process? A significant percentage of first time exposure to the legal system is when someone needs to start a lawsuit. The page attracted 2.43% of traffic, up from #6 position in January 2017, a rise quite possibly related to the Civil Resolution Tribunal’s introduction in 2017. Long time Clicklaw Wikibooks editor and experienced lawyer John Bilawich deserves credit for this popular page from Legal Help for British Columbians that introduces the basics of starting a civil claim. So does the founding author Cliff Thorstenson. While the book has over 140 pages and accounts for 40% of site traffic, historically the main entry page for JP Boyd on Family Law has not been among top site pages (in January 2017 it was #13). This year, there appears to be more traffic from direct links to the book’s main page from websites run by LSS, the BC Provincial Court, private law firms, etc. Although overall the percentage of traffic coming from Google to the whole site has not changed over this period, a disproportionate amount of traffic to this main page now comes from referral sources. This speaks to the overall value of the title and the work of its many reviewing lawyers that make it a destination resource for others in the justice sector. This page from People’s Law School’s title, A Death in Your Family, accounted for 1.81% of all site traffic last month. The equivalent page in January 2017 held #12 position at 1.59%. 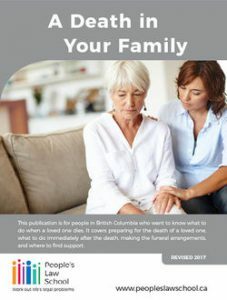 Thanks to Helen Low, QC and Nicco Bautista for their skill abbreviating the legal and practical steps to take upon the death of a family member. 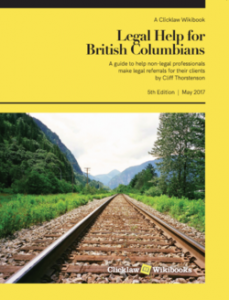 For years, this page from Legal Help for British Columbians was the top destination page on Clicklaw Wikibooks with 2.86% of traffic. In 2017 it dropped to #3 and 2.65%. Today it’s settled at #6 position with 1.81% of traffic. Nearly 90% of this traffic comes from Google searches. Thanks to Rochelle Appleby for reviewing this page over the years, and to its original author Cliff Thorstenson. #7 – How Do I Prepare an Affidavit? Up from #8 position in January 2017, this page from JP Boyd on Family Law accounted for 1.54% of traffic in January 2018. It continues to demonstrate the demand for practical, hands-on tips, and the fact that it derives a substantial greater proportion of its traffic from people who link to the page directly (34% versus the site average of 10% for pages) hints that this is a valuable bookmark for people. Thanks again to Thomas Wallwork for reviewing the page over the years, and to JP Boyd for the original content and practical examples of how to write an affidavit. Editor’s Note: Though these were the most viewed pages/titles on the Wikibooks over the past year, our other pages and titles also received an incredible amount of views. Thank you to all of our contributors and volunteers, whose work makes this initiative possible.